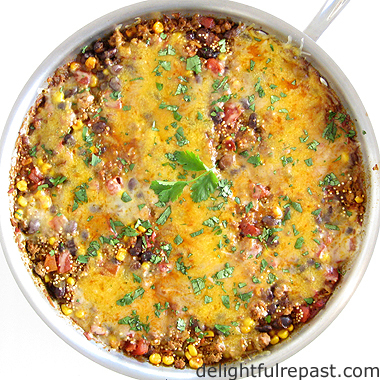 This is an easy one-pan casserole I used to make regularly decades ago. Back then I used cornmeal or rice; now I use quinoa because of its protein content. 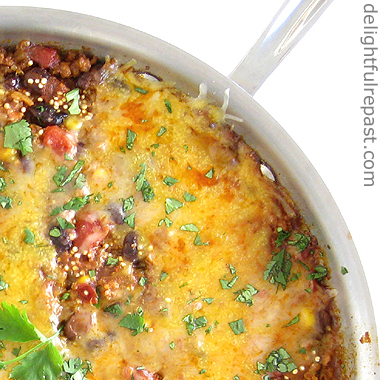 You can serve it on a plate with a side of salad or use it as burrito or taco filling. Either way, you might want to try my Homemade Flour Tortillas. When you need to get a meal on the table fast (and without using every pot, pan and utensil in the house! ), this is the way to go. You can even make it ahead and just reheat portions as needed. Perfect for those days when everyone's eating at a different time. I love beans and could easily forgo the ground meat in this, but Mr. Delightful is not a bean fan and will only tolerate them in a minor role, not as the star. I think the fact that there is an equal amount of corn in it distracts him from the beans so we can both be happy. Speaking of corn, I am "one of those" non-GMO people so I only buy organic corn and corn products. Nearly everything in this is organic. My tomatillo consumption has gone up dramatically since Muir Glen organic crushed tomatillos became available. What is your favorite no-muss-no-fuss easy weeknight meal? * I don't use a commercial chili powder because they typically contain salt and garlic and other things. I make my own blend of two or three plain ground chili peppers. 1 In large skillet that has a lid (I use the All-Clad Stainless Steel 12-Inch Fry Pan with Lid) over medium-high heat, heat the oil. Add the onions and cook for a few minutes until softened. 2 Add the turkey to the skillet and cook, breaking it up, until well browned. Don't just cook it until it is gray or beige instead of pink. Cook it until it is brown and sticking to the pan a bit. I think this improves the flavor of any ground meat, but especially turkey. 3 Stir in the seasonings and diced hot green chiles, and cook for another minute to bring out the aromas. 4 Stir in the black beans, tomatoes, corn, quinoa and tomatillos. Bring it to a simmer, put on the lid and continue simmering for about 25 minutes. Most of the liquid should be absorbed. 5 Sprinkle the shredded cheeses on top and cover loosely with the lid. It will take just a minute or two until the cheese is melted. Take off heat and let stand 5 minutes before serving. 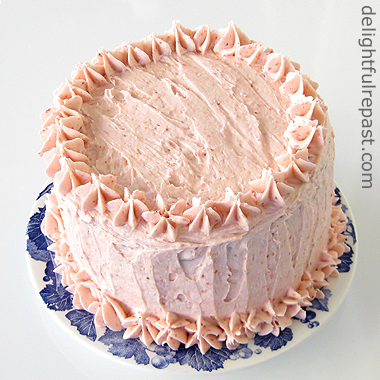 This one-bowl orange vanilla butter cake, iced with Fresh Strawberry Frosting, is the one I made last week in celebration of my sixth blogiversary. Can you see the fluffy texture? 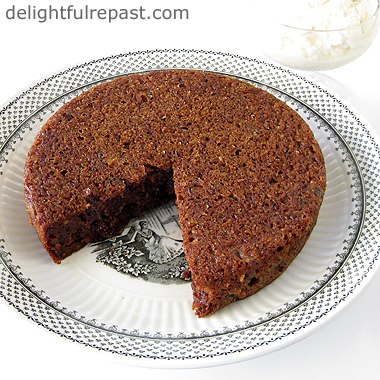 Don't let anyone tell you that you must use bleached cake flour for a tender cake. I don't like bleached flours for health reasons, and it simplifies my life a great deal to use just unbleached all-purpose flour for all my non-gluten-free baking. 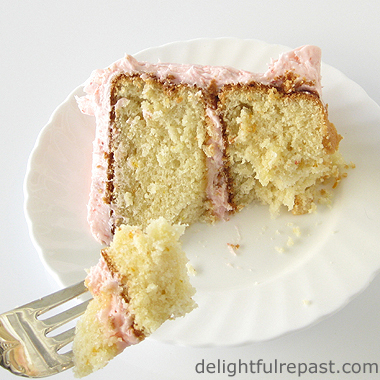 This cake couldn't be more tender and still hold together. My recipe is calculated to make two 6-inch layers, a large enough cake to serve 8 people. 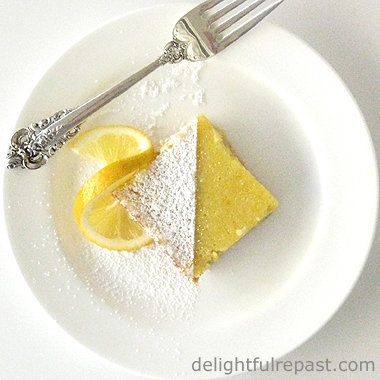 If you want to make a larger cake, here's my Best One-Bowl Yellow Cake. The 6-inch cake looks ever so much nicer on the afternoon tea table and makes 3-inch wedges that fit so prettily on smaller plates. Of course, if you've never made a wedding cake, you probably don't have 6-inch pans! Since this is such a handy size cake, I'd really recommend that you get a pair of these heavy-gauge aluminum 2-inch deep 6-inch round cake pans. I like to point out to my UK readers from time to time that what we call large eggs in the US are just medium eggs in the UK. Large eggs UK are extra large eggs US. It can make a difference in a cake recipe. 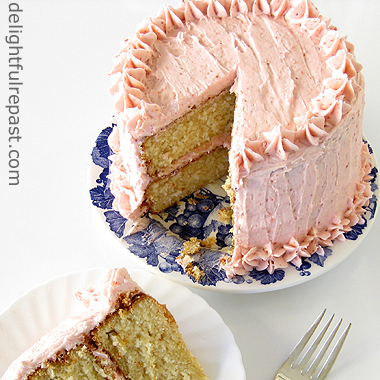 What is your favorite size cake to make, and the most requested flavor in your family? 1 Preheat oven to 350F/180C/Gas4. Grease well and lightly flour two 6-inch round layer pans. 2 In large mixing bowl (I use a Cuisinart stand mixer or a hand mixer), combine flour, sugar, baking powder and salt; and mix on low speed for 30 seconds to blend. Add the softened butter and about half of the milk. Mix on low speed until the dry ingredients are moistened. With mixer on medium-high speed, beat for 1 1/2 minutes. Scrape down the sides. 3 Add the eggs, vanilla extract and remaining milk. With mixer on low speed, beat for 30 seconds to combine. Scrape down the sides. Increase speed to medium-high and beat for 1 minute. Stir in the orange zest by hand; fresh citrus zest tends to get tangled up in beaters and whisks. 4 Divide evenly* between the prepared pans. Bake at 350F/175C/Gas4 for 25 to 35 minutes, until toothpick inserted into center comes out clean. * Most people just "eyeball" it, but when I'm feeling particularly persnickety I actually use the digital kitchen scale to be precise. 5 Cool in pans on wire racks for 5 minutes. Remove from pans and cool on racks for at least an hour, until completely cool, before frosting. On a whim, at this time six years ago, I decided that blogging about food might be fun. I'd been writing for magazines about various things, including food, for a long time; and a food blog just seemed like a good idea. I don't know how I even thought of it because I didn't even read blogs then. And I am not a techie type, so this whole venture did not seem likely to get off the ground. But I thought perhaps I could figure it out and maybe if I posted just once a week I could manage it. Hmm ... what to make? Pizza came to mind as I had recently perfected my pizza dough. And I thought I could stretch it out over three posts and get this party started! So, knowing nothing about food photography or blogging, I grabbed my little camera and headed into the kitchen. Of course, I had to choose a platform (whatever that meant) and a name for the blog (at least that part was easy). My husband is very polite and humorous, often simultaneously, and has said to me after nearly every dinner I've ever made for him, "Thank you for the delightful repast." How could I name my food blog anything else! Then I thought I better look at some food blogs to see how long a post should be, how many photos, etc. I was shocked to find that there were people out there writing very long posts and including a huge number of photos AND doing this several times a week! Well, that wasn't going to happen! Once I got a few posts up as quickly as I could manage, I went to the weekly schedule I've stuck to ever since. And after a couple months I began to add an additional photo or two when it was called for. But including a shot of the bowl/pan as each of 16 ingredients is added was definitely not my style! Not that there's anything wrong with that. "Voice" was another issue. Writing for one's own blog is more personal than writing for a magazine. I had a difficult time loosening up and kept lapsing into a more formal magazine style. Looking at other food blogs, I found a great many new bloggers at that time were trying to sound like the hugely successful Pioneer Woman. She's wonderful, but I just wanted to sound like ME, thank you veddy much! Note to anyone who wants to start blogging: Find your own voice. I so appreciate all of you who follow the blog here and on Twitter and Pinterest. If you enjoy Delightful Repast, I hope you'll share it with all your friends, relatives, coworkers, social media peeps and mere acquaintances! What do you think? If there's anything you'd like to see on Delightful Repast -- anything I might help you with or something you'd like to see more (or less) of, let me know. Your comments mean a lot to me. Thank you so much! And next week, the cake: Orange Vanilla Butter Cake (I love what orange and strawberry flavors do for each other). This one is the 6-inch version, which serves 6 to 8. Would you like this version or the 8-inch? 1 Wash, dry, stem and slice strawberries; you should have about 1 1/2 cups. In blender or food processor, puree sliced strawberries until smooth; you should have about 3/4 to 1 cup. 2 In small saucepan over medium heat, bring puree to a boil. Boil gently, stirring frequently, until puree is reduced to 1/3 cup, about 20 minutes. Remove from heat and cool completely. Note: When you think it's about "there," scrape it into a stainless steel 1/3 cup measure or glass measuring cup. If there's more puree than that, return it to the pan and reduce further. 3 With electric mixer, beat butter until smooth and creamy. Add about half the powdered sugar, and beat until smooth. Add the strawberry puree, vanilla extract, salt and remaining powdered sugar. Beat until smooth and fluffy. Even when persimmon season (October through February) is over, it's persimmon season at my house. I usually manage to puree and freeze enough for a few steamed puddings and batches of cookies. The pudding can be steamed on the stovetop, directions included, but I like steaming it in the slow cooker. I especially like this pudding with Custard Sauce (Creme Anglaise), but Brandy Butter (also called Hard Sauce) is classic as well and makes a nice change. The sauce recipe makes just enough for six servings so you won't be tempted to overindulge. I'd almost forgotten, the other perk of steaming a spicy pudding is the wonderful aromas wafting around the kitchen, the best way to cozy up the place on a winter's day! What's in your slow cooker, stovetop steamer or oven? 1 In small bowl, soak raisins (I also threw in some dried cranberries) in brandy or hot tea for 30 minutes to plump them. 2 Butter well and lightly flour (or spray with cooking spray) a 2-inch deep 7-inch round cake tin. In small bowl, whisk together flour, soda, salt, cinnamon, ginger, nutmeg and cloves. 3 In medium bowl with a wooden spoon, cream butter and sugar. Beat in egg, then persimmon puree, followed by the vanilla and milk. Stir in the flour mixture followed by the nuts and raisins. Turn into buttered tin and cover tightly with foil. 4 Place rack in bottom of cooker, and add boiling water to just below the rack (that's about 2 1/2 cups in the Cuisinart MSC-600 Multicooker). Set the pudding on the rack. Put the lid on the slow cooker. Set to Slow Cook on High for 2 1/2 hours; do not lift lid. Note: Your slow cooker might cook slower or faster, so you might want to check the pudding for doneness after 2 hours the first time you make this. Don't remove the foil, just make a little hole in the center of the foil with toothpick or skewer. Stovetop: Place a rack in bottom of pot large enough to hold the pudding tin. Pour enough boiling water into pot to almost touch bottom of rack. Place pudding mold on rack. Bring to boil over high heat, cover pot and reduce heat to medium-low. Steam pudding, adding more boiling water as needed, until pudding is browned and a toothpick inserted in center comes out clean, about 2 hours. 5 Remove the pudding to wire rack, remove foil and let pudding stand 15 minutes before unmolding onto a small platter. 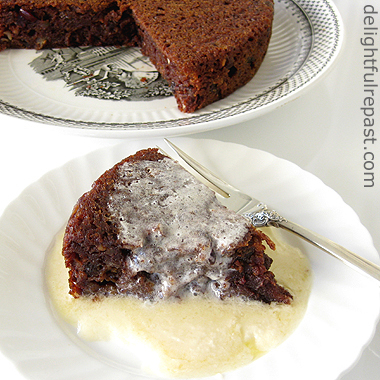 Slice and serve warm with whipped cream, brandy butter hard sauce or, my favorite, Custard Sauce. Note: If making it ahead, even a day or two before, cover and store pudding at room temperature and then reheat before serving. 6 While pudding is steaming, make Brandy Butter Hard Sauce or Custard Sauce. If you prefer your Custard Sauce cold, make it several hours or up to 2 or 3 days ahead. Hard Sauce can be made way ahead; it needs to be refrigerated at least 2 hours or up to 3 weeks. 7 To make Brandy Butter, also known as Hard Sauce: With an electric hand mixer, beat softened* butter until light and fluffy. Add powdered sugar and vanilla extract, and beat until thoroughly creamed. Stir in the brandy a little at a time, incorporating each addition well before adding more. Spoon into a small serving dish, cover and refrigerate for at least 2 hours or up to 3 weeks. Serve it very cold to contrast with the warm pudding. * To soften butter, let stand on the counter until it reaches room temperature and is just spreadable. This will take anywhere from 30 minutes to 2 hours, depending on the temperature of your kitchen. It's always important not to overdo it because the butter can become greasy.